Neti Pot or The Abominable Nose Kettle? Like many of you, I have nostrils. My nostrils have been the source of great pleasure over the years, providing easy access to oxygen, allowing me to french inhale cigarettes in my youth and helping to give my nose definition and the appearance of greater depth. However, as wonderful as nostrils are they are connected to paranasal sinuses, the source of sinus pain and pressure. Living in the southeast, I learned to welcome the changing of the seasons with purchases of sinus medication and fresh boxes of tissues, then something amazing happened. Four years ago I quit smoking and my sinus troubles disappeared nearly overnight. Until this Autumn, I have lived gloriously mucous free. In fact the change had been so complete that I had nearly forgotten about sinus pressure when it popped by to see me again. Over the last few years, I have tried to find small, easy ways to live a healthier lifestyle, nothing political, nothing preachy, I am just getting older and it looks like I am going to have to take better care of this carcass if I want to make the standard “three score and ten”. I did not relish the thought of loading up on sinus medicine, but I was skeptical of more “holistic” methods. Still I felt I needed to try something new, so after hearing about them for years, I finally broke down and purchased a Neti Pot. A Neti pot is simply a small vessel that resembles a teapot that you fill with a saline solution and then you use it to pour that solution in one nostril and out the other in a process called “nasal irrigation”. The principle is that your nostrils and sinuses serve as a sort of “air filter” for your lungs. Pollution, pollen and other “tiny floating air stuff” get lodged in your sinuses causing irritation and eventual infection. The Neti Pot helps sinus problems by cleansing your nasal passages and sinuses of these irritants before they can cause trouble. It is a simple enough concept, and it seemed plausible, plus it is touted as a “new age” ancient technique, so it has that going for it. I figured I had nothing to lose but some discomfort, which I had plenty of anyway, so I set about hunting a Neti Pot. I found several beautiful ceramic ones online, but before I got around to ordering one, I stumbled across one in the Wal-Mart pharmacy. So I plunked down my $14.95 for a hideously designed blue plastic Neti Pot. It was certainly ugly, but it came with pre-measured packets for the solution and it had the added advantage of instant gratification. I mixed up the solution, careful to make sure that my water was not too hot or too cold, but just right. I bent over the sink, made a mental note to be a mouth breather for the next couple of minutes and began pouring water into my nose. At first, it felt like I was drowning, but I changed the angle of my head and it was much better, still weird, but better. Here’s the thing, it works. As the water poured through my sinuses it flushed the sort of things you find in nostrils out and down the drain, and it was not nearly as gross as I had assumed it would be. A few minutes later I “gently” blew my nose, per the instructions, and I was amazed at how much better I felt. Since then, I have been using it every other day and I have had no sinus trouble at all. As weird as the process is, and it still feels strange, I now look forward to it. Kind of like those horrible commercials, it leaves me with a clean, fresh feeling. The Neti Pot is a definite winner in my book, I can’t believe I waited so long to try it out. If anyone would like to send me one of those cool Eastern looking ceramic neti pots, I would be happy to compare and contrast the differences between them, I could even fire up some incense and film it. Since, the “how-to” of Neti Pots was something I was curious about, here are the actual instructions that came with mine. They will give you a good idea of how it works. BTW they are not kidding about the water temp, too hot or too cold is surprisingly unpleasant, so make like Goldilocks. Also, contrary to the image, it is not necessary to smile in step 3, I often grimace when I get that far along, just for fun. Please wash your hands and rinse the device. Fill the Neti Pot with 8 oz. (240 mL) of warm distilled water, filtered water or previously boiled water. You may warm the water in a microwave, but we recommend that you warm it in increments of five seconds. This is to avoid excessive heating of the water as well as the device. Cut the mixture packet at the corner and pour its contents into the bottle. Tighten the cap on the bottle securely, place one finger over the tip of the cap and shake the bottle gently to dissolve the mixture. Standing in front of a sink, bend forward to your comfort level and tilt your head to one side. Without holding your breath and keeping your mouth open, apply the tip of the device snugly against nasal passage and ALLOW THE SOLUTION TO GENTLY FLOW until the solution starts draining from the opposite nasal passage. It should not come in your mouth unless you are tilting your head backwards. Blow your nose gently, without pinching your nose completely because this will apply pressure on your eardrums. If tolerable, sniff in any residual solution remaining in the nasal passage once or twice prior to blowing your nose because this may clean out the posterior nasopharyngeal area, which is the area at the back of your nasal passage. At times, some solution will reach the back of your throat, so please spit it out. To help improve drainage of any residual solution, blow your nose gently while tilting your head to the side. 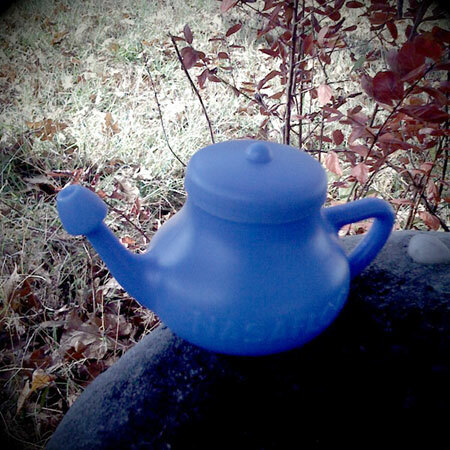 I love my Neti pot–power to the pot…Neti Pot that is…mine is white and gray flecks. Lovely. The idea of them seem so barbaric…more like a torture device than something useful. But they work like crazy. I’m on a CPAP machine at night, and I find that using them before going to bed helps open the nasal passages so that the ‘wind tunnel’ can push the air in and keep me from snoring even more. After reading this post, my husband is on his way to WalMart to pick up a neti pot. Someone told him about this, and I found your reflections — which we really enjoyed! So I will keep you posted on whether this works for him. I am going to check out your other posts now because I found very amusing and witty! I use a ceramic Neti Pot myself, and have found that it works great for me. There is always the scare that it will break (fell a few times in the shower from the plastic shelf) but thankfully no distaters yet, and I have taken it on travels as well. I do not trust plastic.